Being a well known Manufacturer, Exporter & Supplier, we are dedicated towards providing the best quality of Table Top Powder Dosing Machine. As a quality-oriented organization, we are focused to provide our customers excellent quality. Our product is widely appreciated for its optimum performance, durability and high effectiveness. Customers can avail it from us in attractive and protective packages at affordable rate. For our customers, we make available the option of home delivery. Table top Model Powder filler is made strong and vibration free by its specially designed Pillar structure. This is made from Mild steel ROUND Pipe section of good thickness Hard chrome Plated, which holds drive unit, hopper and related parts. A drive motor and an electromagnetic clutch brake assembly are driving the Augur. A safety cover is provided to this assembly to protect from accidents and to avoid dust from drive. Main driven shaft connected to the drive shaft through a Bearing housing holds and rotates freely when the machine is operated. The driven shaft is holding an accurately machined stainless steel AUGUR which performs the filling inside the Nozzle. The lower parallel flights of the auger within the funnel are machined to a constant pitch so that, when filled, each pitch has a precise volume. 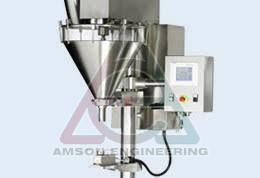 The auger drive rotates the auger at constant speed to produce a continuous dosing flow. The start/stop signals to the auger drive control the pre-set weight in Weigh metric fillers. Machine size - 600 L X 600W X 1000mm height. Load Cell Capacity - 1 Kg, 500Mg. Augur Based filling equipped with digital weighing unit.